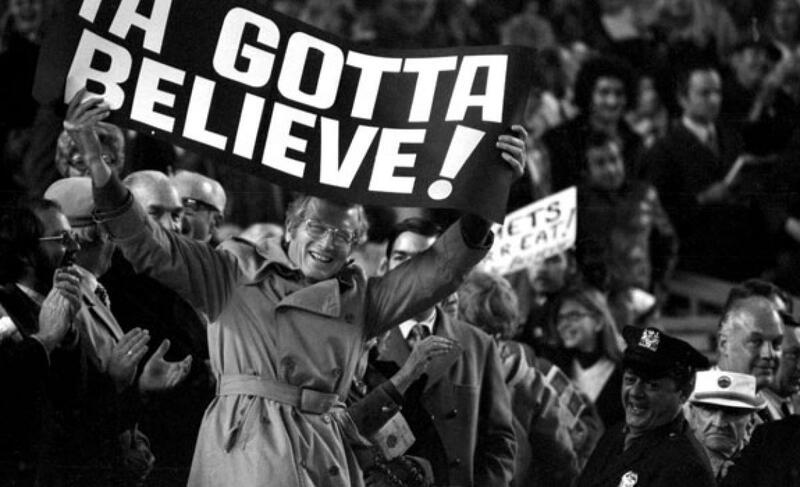 Game Recap: Phillies 4, Mets 3 | We Gotta Believe! The Mets (89-68) lost to the Phillies (60-97) by a score of 4-3. The Mets were undone by a 1st inning 3-run home run by Darin Ruf, and despite two home runs from Lucas Duda, were unable to convert on a slew of offensive opportunities. Bartolo Colon got off to a rough start, and after 1-out singles to Odubel Herrera and Aaron Altherr, Colon allowed a 3-run home run to Darin Ruf to make it 3-0 early. Lucas Duda struck back with a solo home run in the top of the 4th to make it 3-1. In the top of the 9th, David Wright walked against Ken Giles to lead off the inning. After Giles got Daniel Murphy to ground into a forceout and Yoenis Cespedes to strike out, Lucas Duda hit an opposite-field 2-run home run to cut the Phillies’ lead to 4-3. Giles then came back to strike out Travis d’Arnaud to end the game. Overall, it was a game of missed opportunities for the Mets. They had at least one runner on in every inning of tonight’s game, but the team left 12 men on base and was 1/10 with runners in scoring position. Despite 5 walks and 9 hits, they were only able to convert on Duda’s two home runs. Let’s hope Madison Bumgarner can take a bite out of Clayton Kershaw and the Dodgers to help the Mets’ quest for home field advantage. Bumgarner and Kershaw face each other tonight at 10:15 in San Francisco. POSITIVES: Lucas Duda continues his hot hitting, and was 3/5 with two home runs and a hard-hit out. Unfortunately, the one plate appearance in which he didn’t hit a ball hard was a strikeout against lefty reliever Adam Loewen, which left the bases loaded to end a major threat. Bartolo Colon worked around multiple jams and kept his team in the game after the early home run. Jon Niese, while not great out of the bullpen, showed he was able to get some outs. Carlos Torres made his first appearance in 9 days and pitched a scoreless inning; Torres had been recovering from a calf strain. NEGATIVES: The offense, while getting 8 hits and 5 walks, was unable to convert any of their opportunities. Yoenis Cespedes in particular was 0/5 with 2 strikeouts.